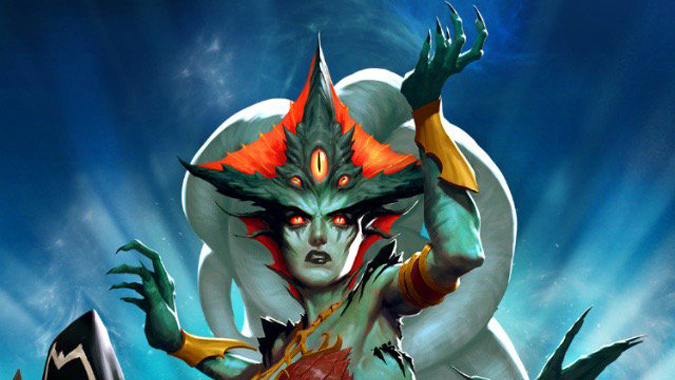 Blizzard just released its official Gamescom 2018 app and it looks like everyone’s favorite watery overlord will be making her debut next week. The key art for Blizzard’s Gamescom excursion includes Azshara front and center. Given that we still haven’t seen the third episode of Warbringers, it’s likely almost to the point of proof positive that we’ll see Azshara’s episode released at Gamescom and online simultaneously. It’s not the first time Blizzard has released cinematics at Gamescom: the Overwatch animated short The Last Bastion also saw its release at Gamescom a couple of years ago. But hey, it’s not all about World of Warcraft, is it? Absolutely not. Blizzplanet released a short video going over everything in the Blizzard Gamescom 2018 app, from scheduling to merchandise. Day one includes event panels for every single game Blizzard produces, including StarCraft. The schedule includes an hour long Diablo panel, which is likely where we’ll see more information about Diablo 3’s release to Nintendo Switch consoles. It’s possible we’ll see some new Overwatch news as well at some point during the convention. Also included on the schedule is a “Guest” panel. While there are no details about who will be taking the stage, we might be seeing something from one of Activision’s other properties. Both Destiny and Call of Duty are now accessible via the Battle.net launcher, so maybe one of them will be taking the stage. The store catalog includes goodies from all of Blizzard’s franchises. One notable inclusion is a portfolio set featuring art from Warbringers: Azshara — once again pointing to the episode’s likely Gamescom release. Gamescom 2018 runs from Wednesday, August 22 through Saturday, August 25. While we have no information at the moment, most Gamescom panels and contests are streamed online so everyone can watch. Everyone should be able to see Wednesday’s panels live — Blizzard should have more information soon regarding where to tune in.